Createspace Independent Publishing Platform, 9781535467155, 108pp. Adult Coloring Journals. Journals are wonderful places to record our daily life. They hold our ideas, dreams, appointments and thoughts. 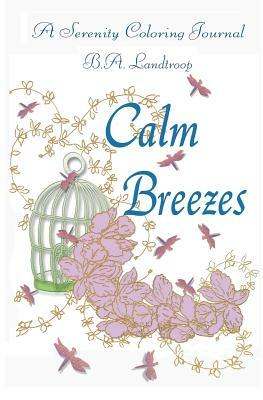 Calm Breezes, A Serenity Coloring Journal is perfect for catching all of these. No matter where you are, since it fits in a purse or bag along with your favorite coloring pencils. B.A. Landtroop lives with her husband, William, at Dove Cottage. Behind the cottage an old creek bed, sprouting daffodils in the spring, is surrounded by gardens. Rabbits hide in the children's Lilly garden. The herb, vegetable and wildflower gardens are filled with Blue birds, Hummingbird Moths, squirrels, butterflies and sometimes a fox. This friendly haven inspired Belinda to create the "Serenity Collection." B.A. Landtroop is a fine artist, graphic artist, writer of short stories, children's stories and a poet. She has won awards for her fine art in watercolor, acrylic, pen & ink and mixed media.